Chris was involved with a student-run program at Marquette University that traveled to New Orleans for disaster relief post-Hurricane Katrina. While rebuilding homes and meeting residents affected by the storm, Chris began thinking about ways in which the tools and resources used to aid those in need could be improved upon. One resident, in particular, inspired Chris because he looked at his community in the Lower 9th Ward, found the problems they faced and not only identified solutions but made those solutions real. Now, Chris strives to look at the many problems communities face and find ways in which innovative product and service design can make a positive impact. 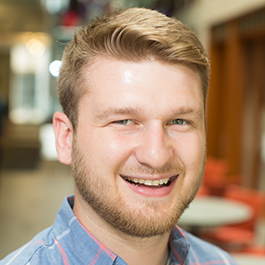 As an undergraduate studying mechanical engineering, Chris became interested in human-centered design while working on his team’s patented senior design project: re-designing the nail remover and finding a way in which a 100-year-old product could be changed to improve the end user’s experience. In the EDI program, Chris hopes to follow his passion for helping others through design and to find innovative ways to create products or services that will directly impact people in need.